The first ten minutes of a homeschool morning really can set the course for the rest of the day. Chances are, if you stumble out of the gate in sluggish lethargy instead of launching out with purpose and a plan, you are dooming your day before it has even begun. You don't have to stand idly by and watch as all your well-laid plans get derailed. You don't have to end the day in frustration or with feelings of failure. Here are my top 5 tips for a PEACEFUL start to the homeschool day. In years past, I inserted one more item on our Good Morning Board. At the very end of the list, I used to have "watch one or two shows on Netflix". We don't have a television hooked-up, but Netflix was a great GO TO motivator during the years that I had nursing baby or toddler. It allowed me to have a few quiet moments with the baby, read my Bible, or take a shower in peace. But, since my youngest is three now and can feed and dress himself, I no longer need that 30-minute babysitter. I can enjoy my own Bible study time and get dressed with sanity while my kids are doing their BIG FIVE. I mention this because I hope it will be an encouragement to other mommas of Lots-of-Littles. While I'm not a big fan of screen time, I'm always a huuuuuge fan of momma sanity savers. 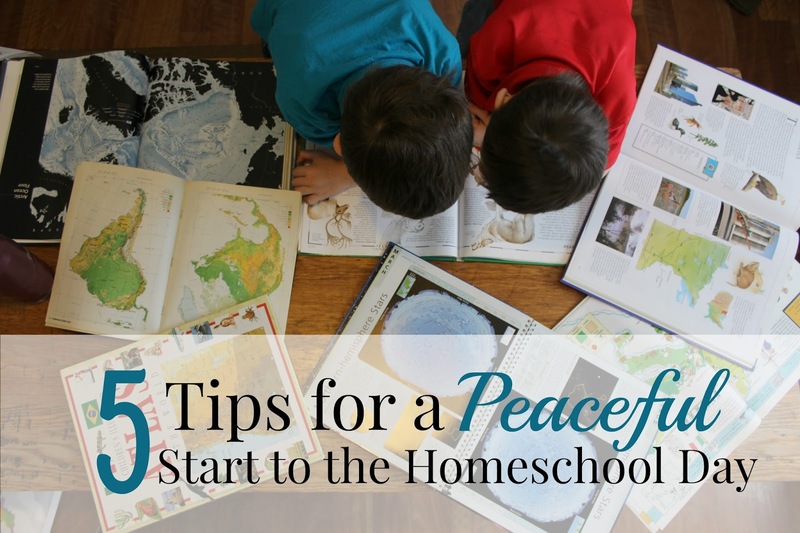 During certain seasons of homeschooling, their morning date with Curious George or Reading Rainbow was a lifeline for me. No guilt! Morning time is for purposeful reading and recitation and relationships. For more thoughts on morning time, I'd highly recommend the Your Morning Basket podcast hosted by Pam Barnhill of Ed Snapshots. While I play our call-to-worship song, my children know to grab their current just-for-fun book on their way to the living room. After morning time, I set a timer and we all spread out to read for 15 minutes. Even my three-year-old knows to grab a few pictures from our library crate. 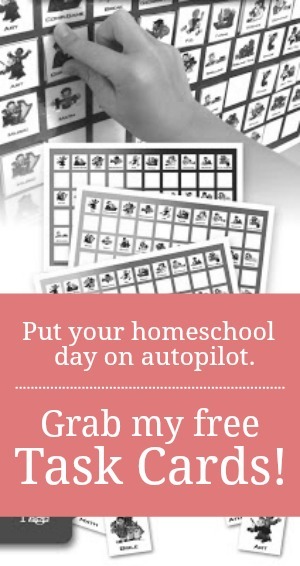 When the timer goes off, we each read a bit more until we can get to a natural stopping place in the story, put our books away, and head off in our own directions to face the rest of the homeschool day. Everyone reads during this time, including ME! It's been a great way for me to get in a few moments of personal reading time and an outlet with which to show my kids a clear example of what a life-long reading habit looks like. It honestly sounds like a peaceful way to start a day. Instead of nagging each child and asking did you do this....did you do that?? I'll definitely be using a few of your tips! Thanks for sharing. It's not perfect, because I'm not perfect and my kids aren't perfect. But, it has helped quite a bit. Oh, how my oldest would love this. She took it upon herself to copy the whole song via a YouTube lyric video. She loves this song. What a great way to start the day. We're just starting our morning basket for the first time next week and I LOVE the idea of having a call to worship song! Thanks for that!! You're most welcome! Hope your Morning Basket time goes well.